SAS Analytics for IOT Featuring Intel's Latest Technology. The Industrial Internet of Things (IIoT) promises major benefits like better factory efficiency and uptime. But to fulfill this promise, manufacturers need a way to sift through the noise and identify the patterns that matter. The solution lies in analyzing streaming data (i.e., data in motion) before it reaches storage (i.e., data at rest). By doing so, you can detect patterns as they unfold. It ...is also important to extend analytics to on-site edge devices to reduce data center workload and enable low-latency responses. 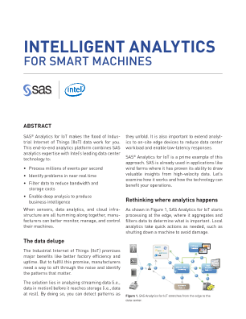 SAS® Analytics for IoT is a prime example of this approach. SAS is already used in applications like wind farms where it has proven its ability to draw valuable insights from high-velocity data.